Quick Air Jet Charter GmbH was established in 1992 at Cologne Bonn International Airport. The company started its operation with three Turboprop aircraft with main focus on air ambulance flights. 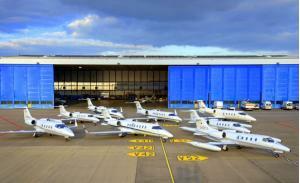 The company grew steadily over the years expanding its fleet to Learjets with worldwide operation. Our dedicated air ambulance fleet comprises three Learjet 55s, three Learjet 35s, a Learjet 36 and a Citation 550. We have a team of 7 fulltime employed, highly skilled operations officers working in shifts to be of service round the clock. Our team members come from various backgrounds; pilots, paramedics, military, VIP charters, international sales. Our common goal is to be of best service to our clients and to understand and support them in their special requirements. Quick Air is part of the Griesemann Aviation Group which is part of the Griesemann Group, an international company specialised in plant engineering and construction. 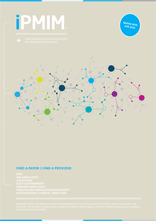 Our parent company employs over 900 people in 9 offices around Europe. The Aviation group consists of Quick Air which has a fleet of eight dedicated aircraft focused on ambulance flights, CCF manager airline, our airline for business flights with its own fleet as well as our subsidiary maintenance facility Air Service Klausheide based at Munster International airport and Cologne Bonn airport in Germany. 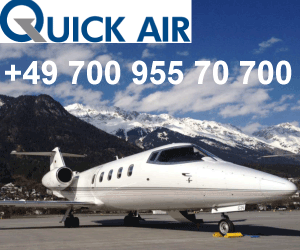 Company: Quick Air Jet Charter GmbH. Address: Cologne Bonn Airport, Hangar 3,D-51147 Cologne, Germany.